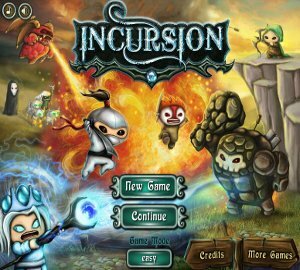 Incursion is the game where you fight against darkness with 27 unique warriors available after various upgrades. You can move them to positions where they are most usefull at any given moment. Inspiration for the game probably came from the Kingdom Rush or Warcraft III : Mithril Plating, Strength of the Wild, Strength of the Moon, but overall feeling of the game is good. Graphics is nice, I especialy like bosses who are challenging and there is a lot of place for combining the warriors. The game can be played in 2 days including bonus stage, and randomness in spells that are obtained make level play out different every time. Lower quality option is available at pause menu, the game can be stopped, saved so there are no bounderies to joy in this tower defense game without getting bored any minute. anonymous: "i will try this suggested tower defense game soon, looks like lot of fun and one more reason to say flash is not dead..."
Solve this complex math: 2 + 7 = ?